**Note: If you did have to reschedule your shower or you end up on bedrest you can switch your shower into a “Sip and See”. Not ideal for everyone but it’s an idea. Ideally, you could do this at someone else’s house so your house doesn’t have to be clean, and I’d wait a bit until you figure out your first few days at home. 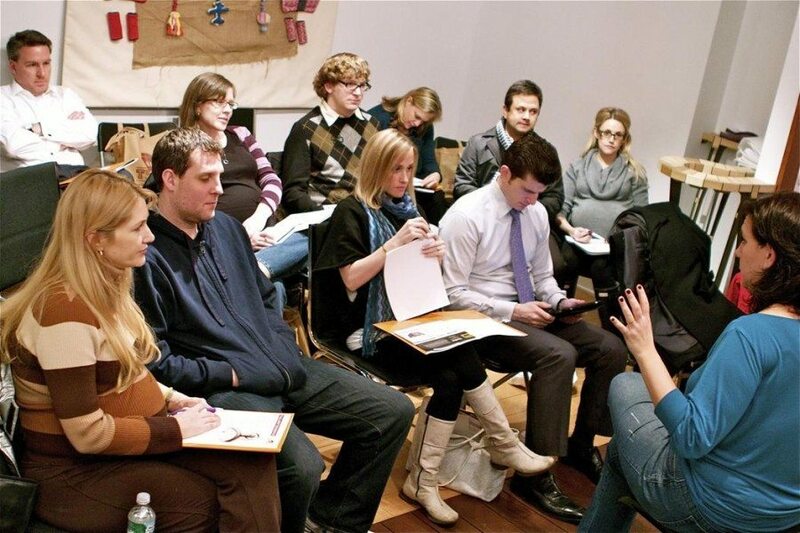 You schedule it like an open house, you set aside a few hours, switch the food to light appetizers or desserts only. Then you park yourself in a comfy chair and your guests come to you. The idea is that people come in, you open their gift (or your significant other does), they see the babies (hold them only if you are ok with it), eat something and head home. “Two Little Birdies Are Joining the Nest” You can use birds or owls for the decorations, and either one can be paired in groups of two. 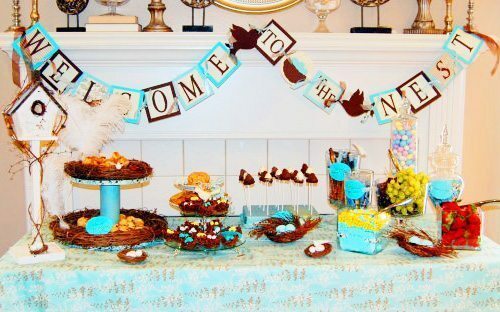 There are lots of cute nest, egg, bird/owl themed premade decorations, or if the shower is near Easter you can repurpose decorations. If you want to forgo typical shower desserts, you can even make those birds’ nest cookies with candy for eggs. 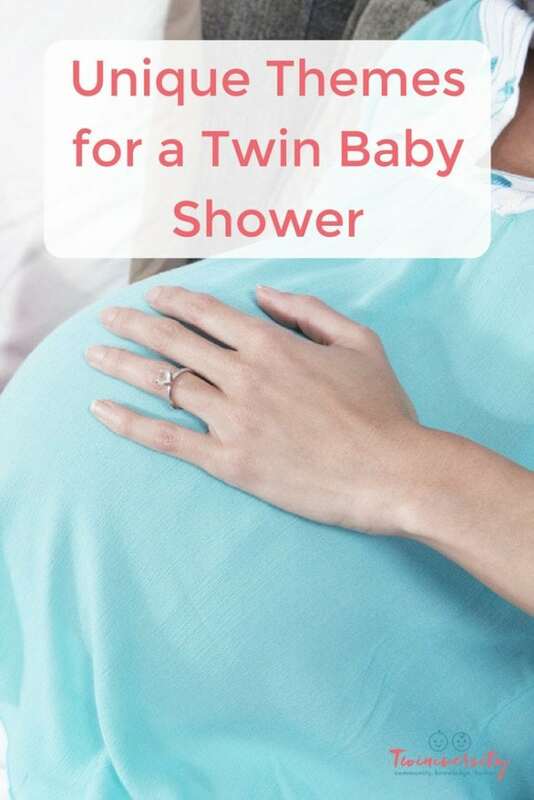 Thing 1 and Thing 2 has become a very common twin shower theme but this could be a very cute alternative. 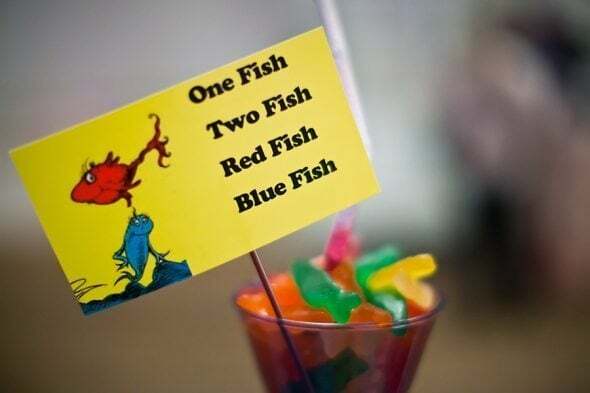 Whether you choose to go straight Dr. Seuss in your style of decorations or stick more to the fish part of the theme, either way, would be super cute. 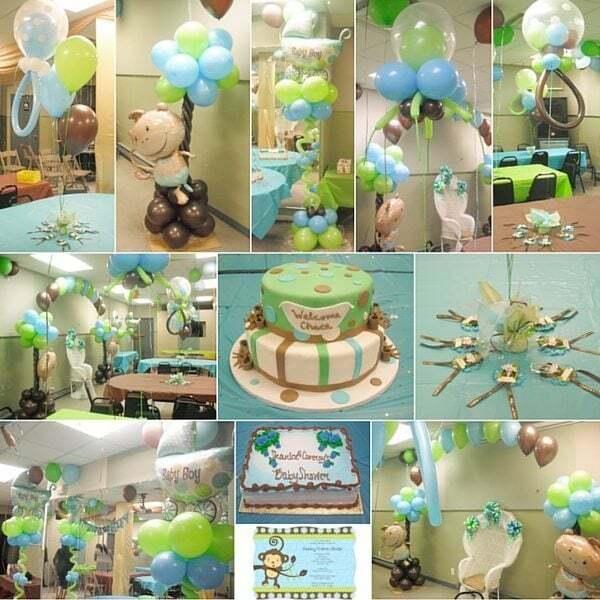 This theme would be perfect if you were planning a less traditional shower (or something like a couple’s shower, or an open house style family shower). 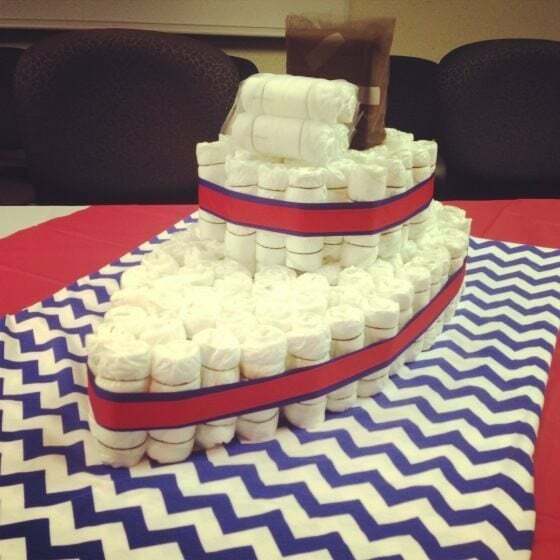 You can add some camping style food to the menu and some marshmallow and chocolate desserts to the cake table. 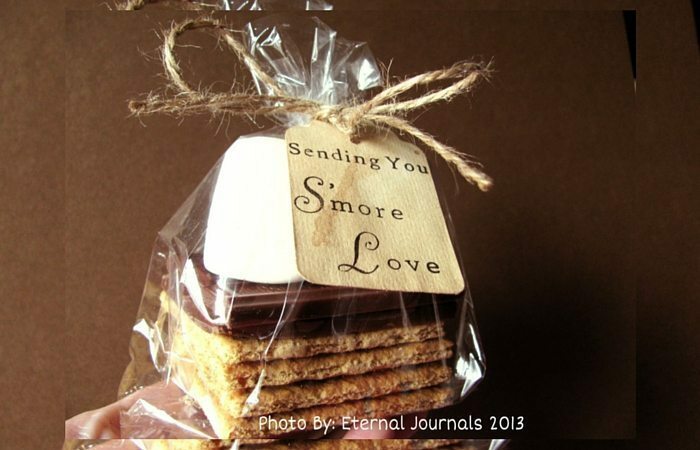 I’m picturing red checked fabric on the tables for the centerpieces, add a mini lantern and some bowls of trail mix to the set the scene and maybe a “DIY s’more kit” or something else camping themed for favors. If you are handy with a Cricut machine, you could make some really cute little paper die cut campfires, tents, and bears for decorations. This theme could be more Monkey specific in the decorations or you can use some of the premade Jungle or Safari themes and just give a little more attention to the monkeys. I have never seen or heard of this one before, but I already have lots of adorable cowboy boot and bandana based decorations. Craft stores like Joann Fabrics usually carry bandanas in a variety of colors (use them for part of the centerpieces). This one might take a little thinking outside the box but it would be very cute when it was all put together. 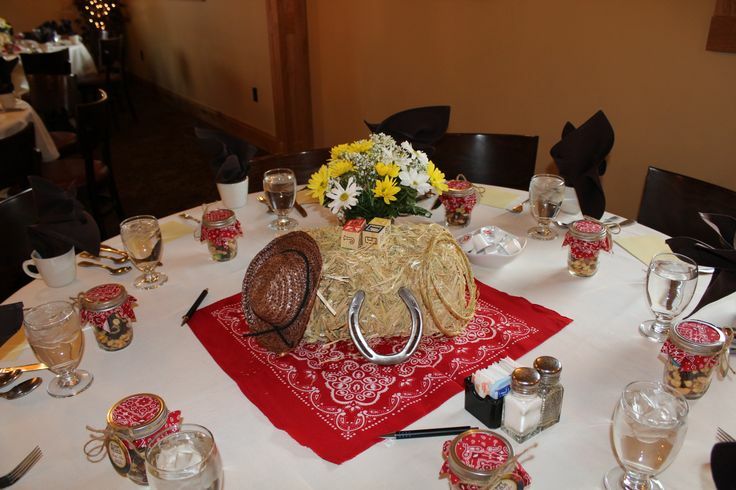 Themes like this one might be cute if you are doing couples or family shower or if the Mama-to-be likes the western style. This one made me laugh out loud when I saw it. (I don’t think I could send out those invites to my grandma without blushing. I know it says “ship” but I still don’t think I could do it.) However it was a fun twist and the theme was all nautical based with lots of anchors, boats, and water-related creatures. Showers already lend themselves to a tea party atmosphere, but you could focus on those details. It would be easy enough to add tea to the menu and teacups and doilies would make a cute centerpiece. Perfect for boy twins born to parents who grew up on Nintendo. Red, green, mustaches and Italian food. Definitely not your traditional theme, but if you are looking for something different it could be done. These are pretty similar in their decorations (with just minor different twists) so I’ll list them all together. Beau & Bow (mustache AND girlie hair bow), Bowties and Hair Bows, Jack and Jill (similar with a possible Mother Goose twist? ), and Ties or Tutus. Based on those commercials from the Wrigley’s gum with all the sets of twins. You can do the double mint gum green or mix it up with some different colors but everything should be in pairs. Tie all your balloons in 2s and distribute them around the room…you get the idea. 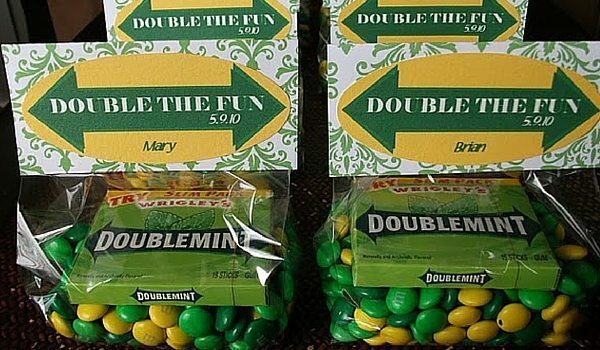 You can make double mint gum part of the favors too. This would pair nicely with any games that involve twin celebs or twin stats. 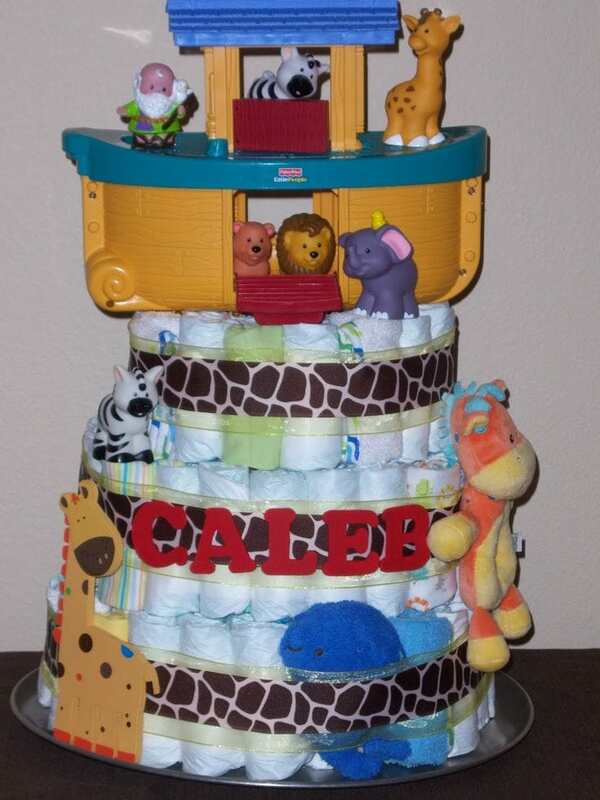 This was my theme, and also the theme for our nursery. There were lots of cartoon animals in pairs. Animal decorations were easy to find, and we just doubled them up putting everything in twos. There are lots of Noah’s Ark baby toys, that you can use as props too (they can double as a gift). This works if you have a boy/girl combo on the way. You can mix and match pink and blue (or your favorite superhero colors and princess colors) or you can do the room half and half with a clear line down the middle. 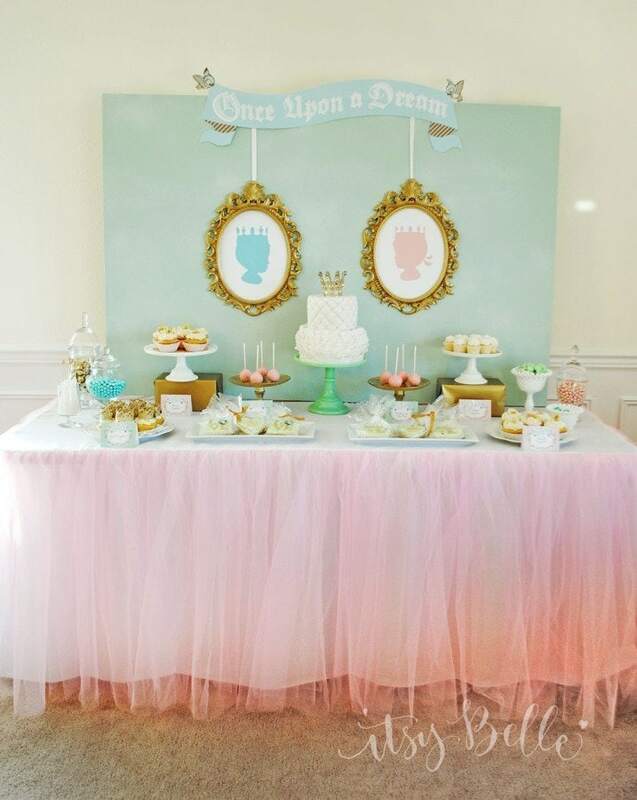 I’ve seen this done for boy/girl twin birthday parties and although the colors might not blend nicely it looks cute. You could even do the cake half and half. Good for gender reveal parties or boy/girl combos. This makes decorating a little simpler because there’s no overarching theme that you have to stick to. Like the above theme, you could do mix and match pink and blue together everywhere or do a pink half and a blue half of the room. This leaves you with a red, white and blue color scheme. 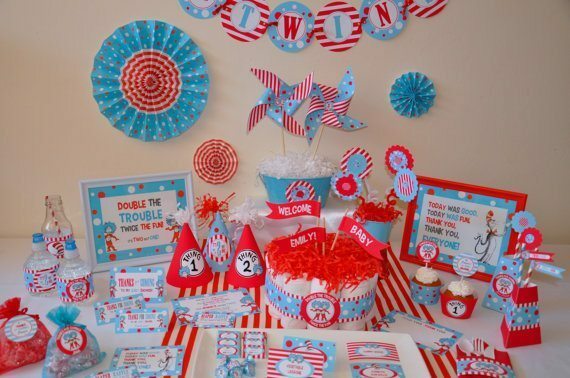 You could even incorporate Dr. Seuss books as table decorations (and gifts for the babies’ library). This is becoming more popular for birthdays too, so there are more decorations available without having to make your own. Do everything in shades of green. This is a great theme for boy twins or undisclosed genders. 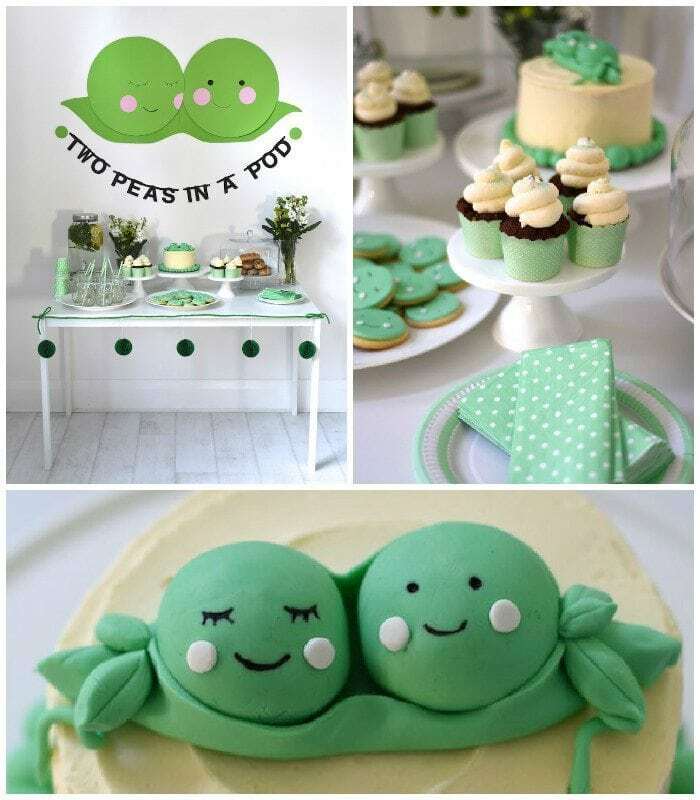 You can find all sorts of cute pea pod cake and cupcake designs, and invites too. I’ve also seen this for triples as well, just by adding one more “pea” to the “pod”. It helps that green balloons closely resemble peas too! Twenty tiny fingers, twenty toes, double the love and double the clothes! Double the Giggles, Double the Grins, _______ and _______ are having Twins! Why Yes, Yes It’s True, the ________ Twins are Almost Due! Twice the Love Every Day, Two Little Babies Are on the Way! Even though it’s a single shower, many of our guests were doubly generous (to help us provide for two babies). Anticipating this kindness, we wanted to make sure we showed our gratitude in the favors. It’s easy to pair things up. For example, two chocolate covered Oreo cookies (you can buy them around holidays or make them yourself and dye the chocolate to match your theme). If you go with a theme, such as the Double the Fun, Wrigley’s gum packs pair nicely with that theme. 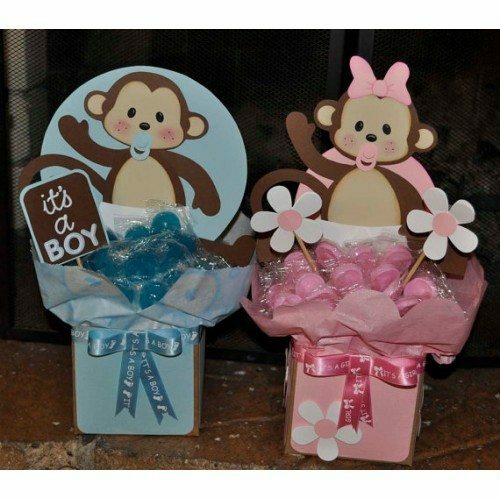 It’s also perfectly fine to go with sugar cookies, color-themed M&Ms, baby bottles full of candy, flower seeds, candles, “Mama’s Ready to Pop” popcorn, nail polish or any other traditional baby shower favor. Famous Twins Trivia – Just find facts about famous twins and make a quiz. 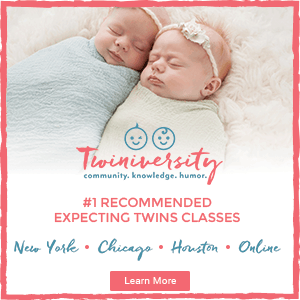 Twin Stats Quiz – Look for statistics about twins and see who can get them all right. 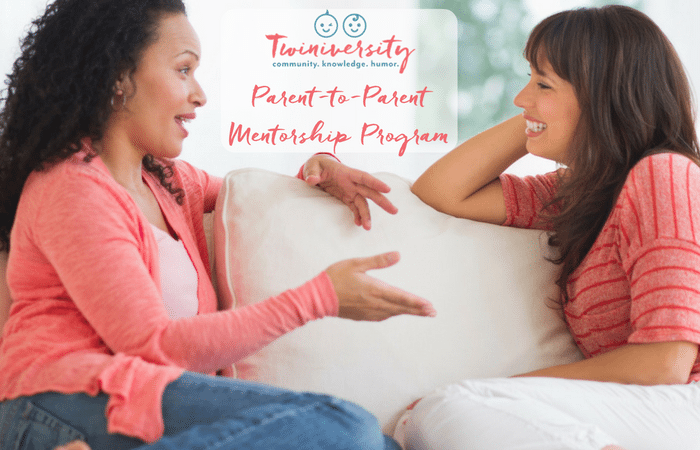 Baby Name Match – Match the baby names with the parents. Throw in some twin celebs to fit the theme but there probably aren’t enough for their own twin celeb baby game. Shower Bingo – Easiest by far! Print blank bingo cards and everyone fills in which gifts they think the parents-to-be will receive. No twin connection here unless you want to give two “free spaces”? Say “Baby”! – Give each guest two safety pins, when another guest catches them saying the specially chosen word (usually “baby”, “babies” or “twins”), they have to surrender one of their pins. Person with the most pins wins. Write a birthday wish and roll it around a candle, on their birthday each twin gets to pick a special candle for their cake (or at two, three, four…they can add a special candle to the regular ones). Have everyone sign a book in honor of the birth (find a birthday themed book), then you can read that book yearly on their birthday, and see all the messages from family and friends. Create a Thumb Print Guest Book where every guest leaves a thumbprint and signed their name. They can be turned into balloons and make a cute piece of art for the nursery. One last thought: make sure that you have a full registry. As I said before, we were very lucky in how generous everyone was and you want to provide lots of options. Even if you end up buying something later after the shower, if it was on your registry usually there is some kind of “Completion Coupon” to buy the extra stuff. Also, many people like to bring a gift when the babies are born so it is nice to have options on the list if they aren’t sure what you could use. Twiniversity Tip: Make sure to visit the Twiniversity Amazon Shop for all our top products for twins! 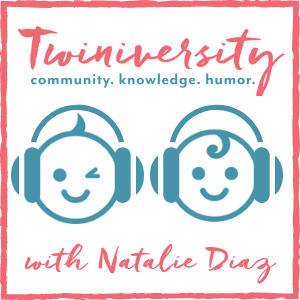 Stephanie Cleland is a high school teacher who traded in her teen students for adorable twin toddlers and now spends her days entertaining her almost 3-year-old “twinadoes”. 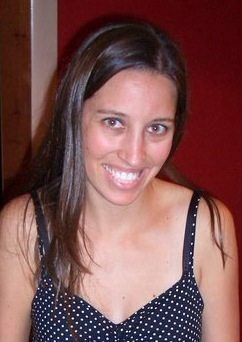 She married her college sweetheart, Kirk, and her hobbies include scrapbooking and other creative projects. She also is working on a blog ilovemytwinadoes.weebly.com.